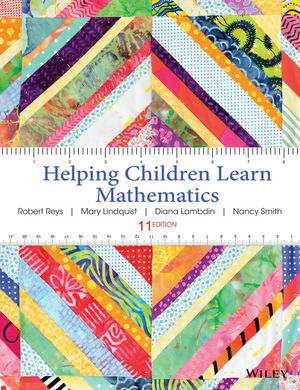 The 11th Edition of Helping Children Learn Mathematics is designed to help those who are or will be teachers of mathematics in elementary schools help children develop understanding and proficiency with mathematics so they can solve problems. This text is built around three main themes: helping children make sense of mathematics, incorporating practical experiences, and using research to guide teaching. It also integrates connections and implications from the Common Core Standards: Mathematics (CCSS-M). Robert E. Reys began his career as a mathematics teacher at Horton Watkins High School in Ladue, Missouri. He has taught mathematics education courses at the University of Missouri since 1966. He has also been a visiting professor in Georgia, Canada, and Japan and was a Fulbright Fellow in Mexico and Sweden. Reys's work has earned him a widely recognized international reputation. The Wiley E-Text is available for this text. It gives students anytime, anywhere access to course content and takes learning from traditional to cutting edge by integrating inline interactive multimedia with market-leading content. The Wiley E-Text brings textbook pages to life with dynamic content such as videos, integrated activities, embedded quizzes, and access to student study tools. NEW Snapshots of a Lesson: These chapter openers include videos that demonstrate effective classroom practices, and provide a smooth, practical segue into the body of the chapter. NEW Common Errors boxes: Illustrate frequent errors and misconceptions that children or teachers often make. NEW Tech Connect boxes: highlight a variety of technology resources, including apps for tablets and smartphones, and URLs that link to information aligned with the content being discussed. Reflects current recommendations from the Common Core State Standards: Mathematics, professional associations, as well as recent research findings. In the Classroom Activity boxes: provide a wealth of ideas and strategies for helping children explore, learn and in some cases practice skills related to specific mathematical topics. Equity and diversity are key issues addressed throughout the book. Practical advice and suggestions about ways to help treat children equally and fairly are provided.